erence Crutcher, left, lowers his right arm as he is pursued by police officers at moments before he was shot and killed by the officer. PROSECUTORS IN TULSA, Oklahoma, have charged a white police officer who fatally shot an unarmed black man on a city street with first-degree manslaughter. Tulsa County District Attorney Steve Kunzweiler filed the charge less than a week after officer Betty Shelby shot and killed 40-year-old Terence Crutcher on 16 September. Kunzweiler said arrangements were being made for Shelby’s surrender. 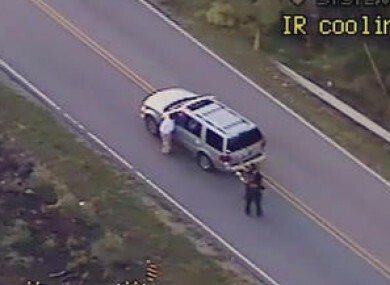 Dashcam and aerial footage of the shooting and its aftermath showed Crutcher walking away from Shelby with his arms in the air. But Crutcher’s family immediately discounted that claim, saying the father of four posed no threat to the officers. They also pointed to an enlarged photo from police footage that appears to show Crutcher’s window was rolled up. And police said Crutcher did not have gun on him or in his vehicle. Among the definitions in Oklahoma for first-degree manslaughter is a killing “perpetrated unnecessarily either while resisting an attempt by the person killed to commit a crime, or after such attempt shall have failed”. Meanwhile, in Charlotte, North Carolina, police have refused under mounting pressure to release video that could resolve wildly different accounts of the shooting of a black man, as the National Guard arrived to try to head off a third night of violence in this city on edge. Charlotte-Mecklenburg Police Chief Kerr Putney said that releasing police dashcam and body camera footage of the killing of 43-year Keith Lamont Scott could undermine the investigation. He told reporters the video will be made public when he believes there is a “compelling reason” to do so. “You shouldn’t expect it to be released,” Putney said. I’m not going to jeopardize the investigation. An undisclosed number of National Guardsmen assembled in Charlotte this evening, sent in by Governor Pat McCrory after a second straight night of racial unrest that seemed at odds with Charlotte’s image as a diverse, forward-looking banking capital of the New South. Charlotte is just the latest US city to be shaken by protests and recriminations over the death of a black man at the hands of police, a list that includes Baltimore, Milwaukee, Chicago, New York, and Ferguson, Missouri. Scores of rioters last night attacked reporters and others, set fires and smashed windows of hotels, office buildings and restaurants in the city’s bustling downtown section. The NASCAR Hall of Fame was among the places damaged. Forty-four people were arrested, and one protester was shot and critically wounded; city officials said police did not shoot the man. Today, in a measure how tense things had become, three of Charlotte’s major employers – - Bank of America, Wells Fargo and Duke Energy – told thousands of employees not to venture into the city. Email “White police officer who fatally shot unarmed black man charged with first-degree manslaughter”. Feedback on “White police officer who fatally shot unarmed black man charged with first-degree manslaughter”.